History: Child with left arm pain. 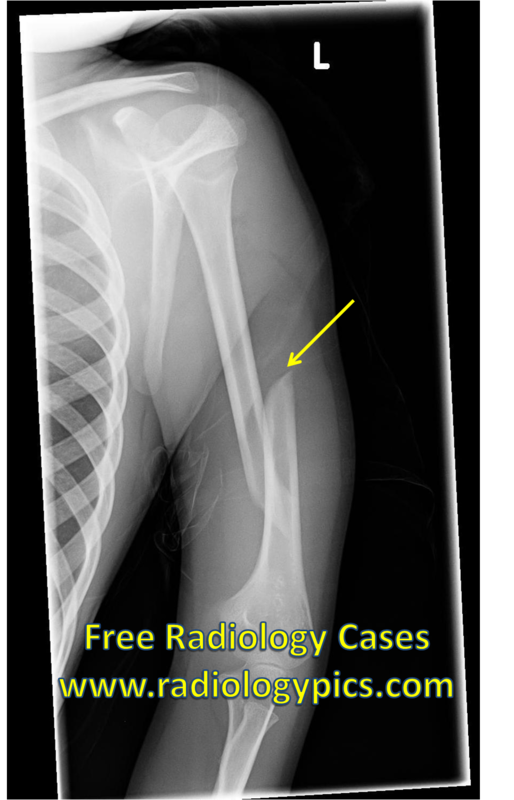 Left humerus shaft fracture: radiograph of the left humerus shows an obliquely oriented/spiral fracture through the distal left humeral diaphysis with proximal foreshortening and lateral displacement. This is a left humeral diaphysis or humerus shaft fracture. In fractures of the humerus shaft it is imperative to assess for radial nerve injury. The radial nerve courses along the spiral groove of the humerus and can be damaged with humeral shaft fractures. This humeral shaft fracture has an eponym attached to it, called the Holstein-Lewis fracture, which is a spiral fracture of the distal one third of the humeral diaphysis that is commonly associated (22%) with radial nerve injury.